The ability for soldiers to identify, process, and comprehend critical information, and to communicate clearly in their environment is key to the success of any mission. The most skilled soldier can have the most advanced weaponry and technology at their fingertips, yet if their hearing has been compromised by unprotected exposures to hazardous noise, they may find themselves sidelined from the mission. Hearing readiness can be a make or break point for soldiers on the precipice of deployment. 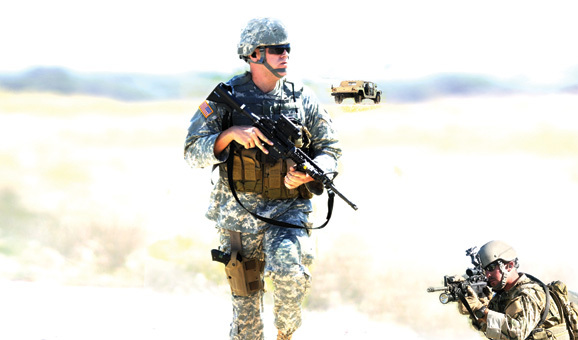 The US has outfitted troops with Honeywell QUIETPRO tactical communication and protection system (TCAPS), providing the them with smart personal hearing protection, full situational awareness enhancement, and the clearest incoming and outgoing communication throughout the full spectrum of training and deployment operations. In 2011, the US General Accounting Office issued a report that cited several deficiencies in the Department of Defense’s (DOD) efforts to prevent hearing loss amongst Soldiers, Sailors, Airmen, and Marines.1 One such deficiency was “how well the military evaluates Hearing Conservation Programme performance;” in essence, the effectiveness of hearing loss prevention and improvements to hearing readiness. Though the DOD is developing a Hearing Center of Excellence that will span all branches of the Armed Forces and VA3, each branch is taking stronger preventive measures to ensure the hearing readiness and fitness for duty of its troops both on base and in combat. The US Marine Corps (USMC) has now taken an even more aggressive hands-on approach to hearing loss prevention. In an audit of the USMC’s audiometric test records by the Naval Audit Service, there was evidence that a large number of Marines did not have record of an entrance or exit audiogramme within 60 days of their entrance or exit from services. The audit also revealed that 6,300 Marines experienced a documented hearing loss or hearing-related injuries between 2001 and 2008. In addition, more than 9,000 claims for hearing loss were made by retired Marines between 2007 and 2009 — which could cost upwards of $404 million. In January 2012, the USMC issued a directive that both recognised the deficiency in its Hearing Conservation efforts and issued new orders to institute a programme with direct oversight by Unit Command. This directive requires Unit Commanders to report on the status of its Hearing Conservation Programme on a regular basis throughout the year. Also required is the implementation of engineering and other noise controls when feasible on base, and the mandatory use of hearing protection devices when Marines and civilians are exposed to hazardous levels. Figure 1. Distribution of Personal Attenuation Ratings. Test data from Howard Leight Acoustical Test Laboratory, San Diego, Calif. In order to fulfill the USMC’s new Directive, one installation has taken a holistic approach to its Hearing Conservation Programme for Marines and civilian employees alike. At the Marine Air Corps Station in Miramar, Calif., a new approach is being implemented that balances classroom training about Hearing Conservation with hands-on earplug fit training and testing5. This approach, which has been embraced by several Fortune 500 companies, enables individuals to know exactly how much attenuation they receive from their earplugs and understand this information in the context of their noise exposure levels. Through new earplug fit testing technologies, those who are required to wear Hearing Protectors on base and in combat can now have an accurate, real-world picture of hearing protector effectiveness — providing a starting benchmark on which to build their Hearing Conservation practices. First and perhaps foremost, fit testing provides a formal metric from which one can determine whether an individual is receiving optimal protection for their noise environment, requires additional training on how to fit their ear plugs, or needs to try a different model. Earplug fit testing benefits Unit Commanders and Marines alike. For the Unit Commander, it fulfills the Directive’s requirements for training with documented results. For each Marine, it demonstrates the importance of proper protection and helps them select and compare protectors to find the best choice for their ears and specific applications. Researchers in the study then interviewed the participants who obtained high attenuation values to determine the common factors that contribute to good earplug fit, and hence, good attenuation in use. Only one factor was found to be a consistent predictor of good fit: one-on-one training. That is, the more often an individual had received individual training in the proper use of hearing protectors, the higher the probability was of a good fit. The same was not true for group training, such as watching annual training videos or passing out brochures. The importance of fit testing as a critical element of one-on-one employee training cannot be overstated. No generalised rating scheme for hearing protectors can be effective without knowing how much attenuation individuals actually attain. If a supply clerk were to supply earplugs based on the assumption that all earplugs only achieve half of their published attenuation in the field, then clearly two-thirds of the 100 participants in the study would be seriously overprotected, since they are achieving much higher protection than 50 percent. Fit testing of hearing protectors bridges the gap between the laboratory estimates of attenuation and the real-world attenuation achieved by Marines as they normally wear their protectors. The US Army Aeromedical Research Laboratory is conducting a comparison study of the existing technologies for earplug fit-testing. In the test, Army audiologists conduct earplug fit testing during the second follow-up visit for soldiers showing an STS during routine, annual audiometric evaluation, and after the first follow-up visit. The preliminary report about the experience of the audiologists detailed the pros and cons of each method of fit testing. The audiologists were enthusiastic about the ability to fit test earplugs. For several years, the USMC has deployed its troops into combat in Iraq and Afghanistan with the most advanced technology available. From next generation body armor to night vision goggles, over 50,000 Marines have also been outfitted with the Honeywell QUIETPRO tactical communication and protection system (TCAPS). QUIETPRO provides Marines with smart personal hearing protection, full situational awareness enhancement, and the clearest incoming and outgoing communication throughout the full spectrum of training and deployment operations. For Marines, hearing is one of their most important weapons. On the battlefield, soldiers are always taught to “Shoot, Move and Communicate.” Half of communication is the ability to hear. QUIETPRO delivers the ability to clearly transmit and receive communications (via comms radio) without compromising speech intelligibility. QUIETPRO QP400, the next generation of Honeywell’s TCAPS, improves a soldier’s two-way communications and speech intelligibility, especially in high noise. Its patented digital Active Noise Reduction (ANR) technology delivers revolutionary results by continuously monitoring ambient sound and reducing the levels of noise across the spectrum of frequencies to acceptable levels in real time. This allows soldiers to hear ambient sounds at safe levels – even in intermittent and impact noise – and provides increasing low frequency attenuation for clear, intelligible communications. On foot patrol, mounted in a vehicle, or in the air, QUIETPRO QP400’s new quick connection/disconnection cables allow full jump-on/plug-in transition on all mobility platforms. QUIETPRO QP400 now features a four-channel/intercom capability through a smart comms hub, and adapts to the widest range of radio and intercom platforms, enabling soldiers to be networked and connected during all stages of their mission. QUIETPRO QP400’s new push-button interface provides quick and easy access and control of functions while its one-side cable design eliminates excess connections. Its new voice feedback menu walks the user through each function for easy operation, and control of system function and modes. Since entered into operational service, more than 63,000 of the original Nacre QUIETPRO intelligent hearing and communication system have been fielded across 13 countries. More than 40,000 are in daily service with the US Army, US Marine Corps, US Air Force, US Special Forces and US government agencies— and is the only in-ear intelligent hearing protection and communication system approved for the US Army Nett Warrior soldier modernisation programme. 1. United States Government Accountability Office. “Hearing Loss Prevention: Improvements to DOD Hearing Conservation Programs Could Lead to Better Outcomes,” GAO-11-114 (January 2011). 2. Saunders, Gabrielle H. and Susan Griest. “Hearing loss in veterans and the need for hearing loss prevention programs,” Noise and Health (2009).